Massive wood pellet demand mainly from South Korea as the primary market has encouraged the growth of wood pellets wood pellet industry in Southeast Asia. Indonesia, Malaysia, Thailand and Vietnam are the countries that responded positively to the demand of wood pellets from the South Korea. The growth of industrial wood pellets in each country is different speed depending on the readiness of the industry, the availability of raw materials and ease various other business support facilities. Although Indonesia is slow to respond to the demand of wood pellets, but in fact Indonesia has a tremendous opportunity to lead this industry due to the potential availability of abundant raw materials from waste-wood waste and cultivated by making a energy plantation. The extraordinary potential in Indonesia is ogled by Korea to increase the volume of exports of wood pellet to Korea, which means that the growth of industrial wood pellets should be accelerated. The greater the demand and lack of supply pushed the price of wood pellets is expensive, so the more the industry grows to gain momentum at this time, when the demand is very large, while its minimal supply. Timber industry wastes which initially becomes a problem when it began to be seen as a potential raw material for industrial raw material in wood pellets. 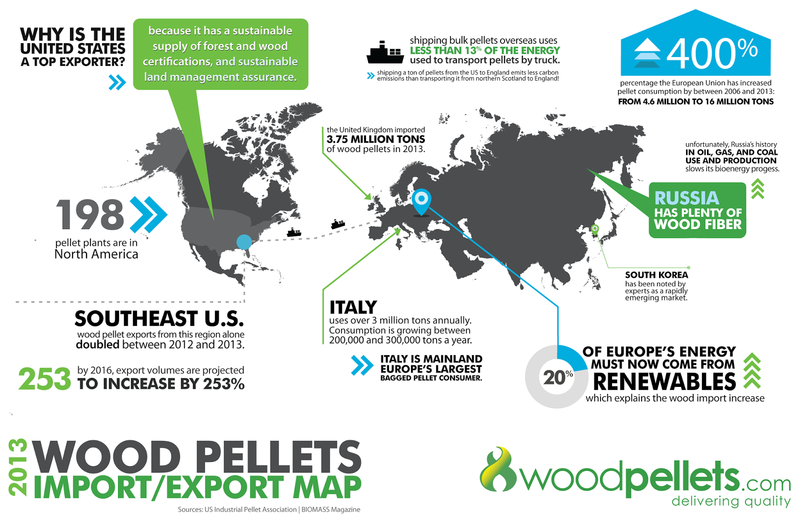 Wood pellet market will be even better if the global awareness of the use of renewable energy, particularly biomass is getting better and sustainably cultivated globally or countries compete to lower the temperature of the earth. For the wood pellet market in Asia, besides Korea now Japan also have started to squirm. Availability of woody biomass for the production of wood pellets and when raw materials cultivated through energy plantation take a longer time, has made the pellets from biomass such as pellets from palm empty fruit bunches (EFB Pellet) have also been received, the insistence current needs. If awareness of the environment and climate change has been conceived and implemented in the environmental regulations or the global energy industry or business trends in particular wood pellets and biomass to energy in general will grow and survive long enough. Wood Pellet For Green…Green World!